Promotion runs from 11:00 GMT on the 4th of February 2019 to 22:59 GMT on the 10th of February 2019. 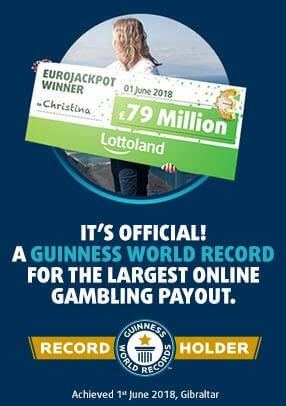 In order to participate in the promotion, players must be logged into their Lottoland account, open any of the qualifying games and click on Claim within the promotional period. Upon completion of the staking requirement, a notification will appear with the option to claim the Bonus Spins. The bonus spins will be unlimited until a guaranteed win amount is reached. Once the guaranteed win has been achieved, a pop up will appear offering players the opportunity to participate in the next level. There are five levels in total. Once a level is triggered, players will have 4 days to opt-in to it. Once a level is claimed, players will have 4 days to meet the staking requirement. While using the Bonus Spins, the player may continue spinning until the minimum guaranteed win amount is reached. There is no maximum restriction on how much can be won whilst using the Bonus Spins. The Bonus Spins may be only be wagered on the following games: Sumo Spins, Dragon’s Luck and Crazy Genie. Unused Bonus Spins will expire 7 days after being claimed. This promotion is only available in the following currencies: EUR, GBP. If your account is in another currency, you may not participate.